We, "Monad Electronics", established in year 1998, is an exporter, manufacturer and supplier of transducers and Instrumentation sensors. Manufacturer of load cells, torque sensors, pressure sensors, multi-axis sensors and related instruments and software. Process control is a statistics and engineering discipline that deals with architectures, mechanisms, and algorithms for controlling the output of a specific process. Whatever the industry is, be it the manufacturing, processing or packaging we can provide an optimized solution, including hardware and software packages – custom configured to meet exact & precise requirements. Whatever your measurement needs, we are able to offer complete solutions to your measurement needs, Since we design& manufacture both Sensors and instrumentation, and customize them if required. Our system and application engineers possess the know-how needed to solve intricate application requirements. We are happy to put our expertise to work for you. We also growing exporter for the countries we export to are Central Asia, Middle East, Europe, Brazil and America. Manufacturing, Trading, Importer and Exporter of Engineering Machines. Our dedication to provide the best possible solutions to our customers has been instrumental in contributing to our phenomenal growth. We apply strict quality check and best manufacturing and designing techniques, for meeting our customer specific requirements. Our success can be attributed to continuous innovation in our products along with advance features as per industry and customer requirement making our product competitive and our continuous effort to keep them economically viable. Our organization is backed by an skilled team of engineers, technicians, quality assurance staff, and administration personal. Research & Development R&D in Monad Electronics begins immediately on customer’s feedback i.e when the customer’s demand a more advance features in the product ordered or when in house observation related to improvement is suggested. Whatever your measurement needs, we are able to offer complete solutions to your measurement needs, as we design& manufacture both Sensors and instrumentation, and customize them if required. Our system and application engineers possess the know-how needed to solve intricate application requirements. We are happy to put our expertise to work for you. 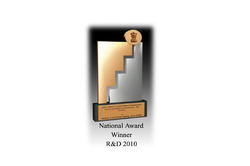 Moand Electronics is a proud winner of national award in R&D in year 2009-2010.